← Differentiation, Student Choice, and Reflection–Oh My! So what if we did value our students’ work and helped them apply it in the here and now? GID does just that–it values students’ work, their learning process, and their thoughts and feelings about their work. 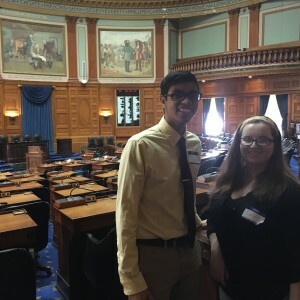 Recently, our library educator Anita Cellucci, two of my students, and I went into the Boston State House for Library Legislative Day. The day is all about promoting the importantce of public libraries and school libraries in our communities. Anita had the brilliant idea to actually bring in two of our students to present their Psychology in Literature GID projects in connection with a LSTA grant that Anita was awarded this year. The grant focuses on promoting a stigma free attitude toward mental health in schools. 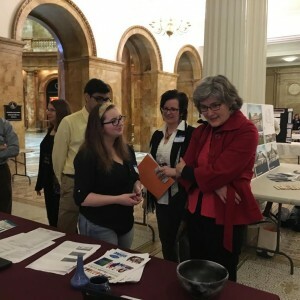 The experience was a “real world” opportunity for our students to take the valuable research they had gathered through GID in their senior English seminar Psychology and Literature and showcase it to governement officials in Boston. Because we chose to have students create a google slide presentation or a prezi, we were able to set up the laptops at our booth. Our students could then conduct a bunch of mini-presentations for the officials as they walked by. The students felt so empowered that their research was valued beyond their teachers and classrooms to a state wide level. One state representative stopped and asked our students a long list of questions about mental health and teenagers. The representative was so excited to have the opportunity to run by some of her mental health initiatives to teenagers. Our students shared honestly and openly about their experiences as millenial teenagers in high school today. Students at the Boston State House for Library Legislature Day. Students sharing their GID projects at Library Legislative Day in Boston. The more we value our students’ work by providing them with “real world” opportunites and experiences within schools, the better prepared socially, academically, and emotionally they will be when they graduate. For their “real world” will continue rather than begin. Please find below links to four examples of presentations that students created using google slide presentation or prezi with screen castify for the audio recording.